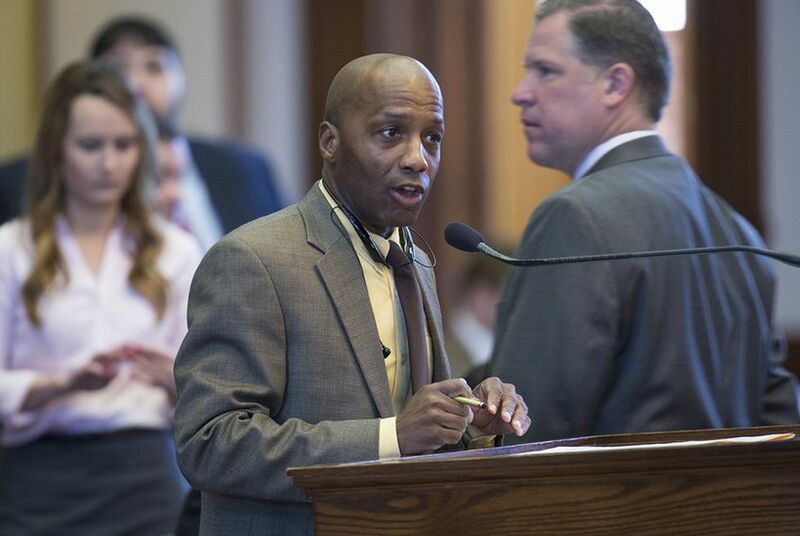 Rep. James White's House Bill 1676 would create a state-funded office to represent death-sentenced inmates who can’t afford their own lawyer in their direct appeals to the Texas Court of Criminal Appeals. In a tight budget year, a Republican Texas lawmaker is trying to pass a bill that would create and fund a statewide office of appellate attorneys to represent death row inmates. Last week, Rep. James White, R-Hillister, filed House Bill 1676 to create the Office of Capital Appellate Defender. The state-funded office would represent inmates sentenced to death who can’t afford their own lawyer in their direct appeals to the Texas Court of Criminal Appeals — the time when convicts can raise issues from their trial. Currently, the convicting court appoints an approved lawyer for this step of the appeals process and the prosecuting county pays the bill. White, who represents five rural counties in East Texas, said the bill is one way to help struggling counties that have had to raise property taxes while dealing with unfunded state mandates, such as paying for indigent defense. And as chairman of the House Corrections Committee and representative of the district that houses most of Texas’ death row inmates, he wants to ensure the state is being thorough when handing down the harshest penalty it can impose. White has estimated the office would cost $500,000 a year, which could put the bill in jeopardy as lawmakers work to tighten the state's budget for the coming biennium. State Rep. Joe Moody, an El Paso Democrat who heads the House Criminal Jurisprudence Committee, said the policy is one that will probably find "general consensus" in the Legislature but that anything with a cost attached to it this year could be difficult to pass. "Everything’s being scrutinized very closely, and this would be no different," Moody said. "However, I will say that criminal justice reform is one of those things that we have found a lot of consensus on. So it may be one of these issues that we’re able to figure out a way to get this done." Representation for Texas death row inmates on direct appeal is often lacking, according to a report from the Texas Defender Service, a nonprofit organization of death penalty defense attorneys. The report, released in September, claimed appellate attorneys who represent death-sentenced clients are often overworked, underpaid and unqualified. And appellants who received the death sentence in other states are 2.8 times more likely than those in Texas to have their cases reversed on direct appeal. After White read the Texas Defender Service report, he approached the organization, according to Amanda Marzullo, interim executive director and policy director for the organization. “This bill and the creation of this office is essential to basically maintaining the integrity of Texas’ death penalty because the quality of representation is so poor,” Marzullo said. The office would allow for a small group of statewide attorneys to handle direct appeals, at a consistent rate and consistent caseload, according to the Texas Defender Service report. The current county pay scheme ranges greatly, from low flat fees to hourly rates without caps. Fees between 2009 and 2015 ranged from about $10,000 to $80,000. And because smaller, poorer counties often paid lawyers less, attorneys often had multiple appellate cases as well as a private practice, spending significantly fewer hours on each case than lawyers in other parts of the country, according to the report. “Even if you’re a great attorney, if you’re paid $10,000, you’re not going to be able to keep the lights on and do everything you need to do on the case,” Marzullo said. Although his bill would add to a state budget that is trying to cut funding across the board, White estimated the cost of the appellate office could stay relatively low because of fewer new death sentences being pursued statewide. After life without parole became available as an alternative to the death penalty in Texas capital murder cases in 2005, about 10 new death sentences were handed down each year — a sharp decline from the nearly 50 sentences in 1999, according to the federal Bureau of Justice Statistics. Recently, that number has dropped even more, with only two new death sentences in 2015 and four last year. Almost all death penalty defendants qualify for indigent defense because the trials and appeals are so costly. Still, the Texas Defender Service report said a handful of statewide attorneys could cover the caseload in Texas at the current rate of new sentences, in addition to training lawyers and monitoring changes in death penalty law. The concept of funding a statewide office for capital appellate attorneys isn’t new. In 2009, the Legislature passed a similar bill that created the Office of Capital Writs (now the Office of Capital and Forensic Writs) to provide attorneys for death-sentenced appellants during state habeas appeals — the part of the appeals process that looks at issues outside of the trial, like new evidence. The state currently pays $1.4 million a year for the office. Though no known opposition has formed against the bill, Shannon Edmonds of the Texas District and County Attorneys Association said some prosecutors might not like the idea of a statewide office, thinking it will add to the already frequent delays in the death penalty appeals process. But Marzullo said the office would actually resolve issues at an earlier point in the proceedings by having more qualified representation. For White, the bill is worth filing even if it faces scrutiny for costs or any other reason. "You've got to start the discussion," he said. In his State of the Judiciary address, Texas Supreme Court Chief Justice Nathan Hecht discussed bail reform, the cost of legal expenses, mental health issues and a host of other topics.